After some requests I decided to write a new post about the top things to do in Langkawi, Malaysia. This time for non-romantic people, or better saying “regular” tourists. And I’m gonna prove that this beautiful island is great fun for any kind of traveller. Our last post was all about love and how Langkawi is The Perfect Romantic Destination for couples and honeymooners. After publishing it I realized that there are so many things to do in Langkawi that people who aren’t in love should enjoy too! So here is our Langkawi travel guide focusing on adventure, nature and water sports. 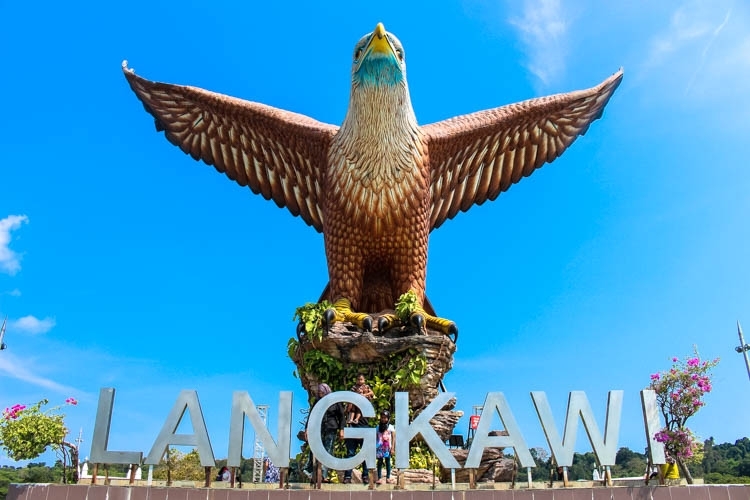 Langkawi has so many attractions that you´ll need at least one week there to enjoy everything. Before you enjoy the island you need to arrive there! How to get to Langkawi? Langkawi is known as “The Jewel of Kedah”. 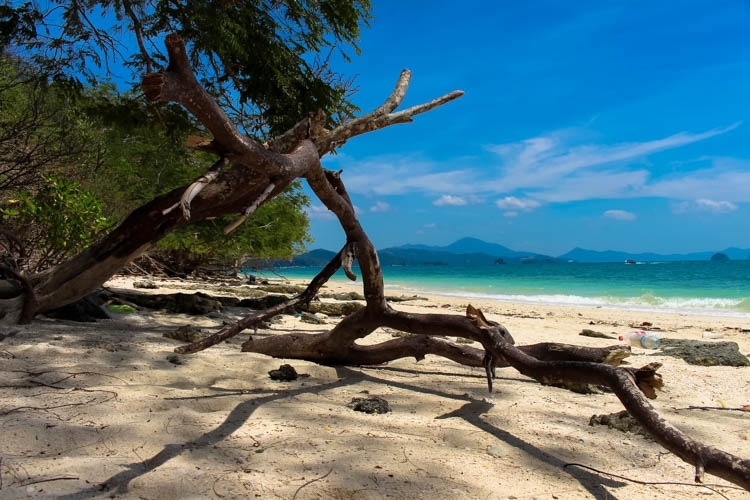 It is an archipelago of 104 islands located in the Andaman Sea, 30 Km from the mainland coast of Malaysia. The main island is where all the hotels, resorts and attractions are. To get there you have two options: by flight or by boat. The easiest and most common way is via Kuala Lumpur. Please spare some days to explore Malaysia’s capital, “KL” offers so many attractions, from temples to rooftop bars. To help organizing your trip to Kuala Lumpur have a look at Expedia Malaysia’s travel guide. » By Flight – International flights land at Kuala Lumpur and Penang Airports. From there you can take another flight to Langkawi, low-cost air companies have daily flights. 😉 To check the best rates we always use Skyscanner, if you have an open schedule this website is perfect to find the cheapest price! » By Boat – You can reach Langkawi by boat from three different cities in Malaysia (Kuala Kedah, Kuala Perlis and Penang) and two cities in Thailand (Satun and Koh Lipe island). The timetables and fares you can check on the website of Naturally Langkawi. 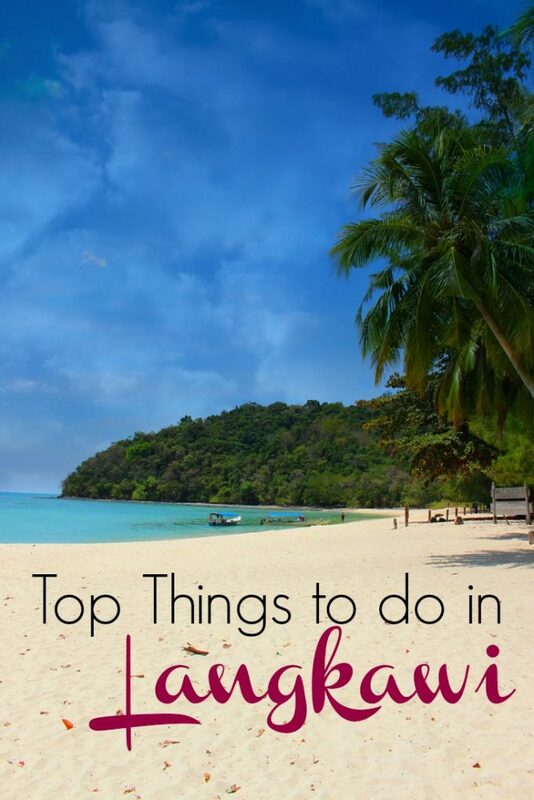 Top Things to do in Langkawi! Now that you arrived in Paradise, Let’s enjoy! Langkawi is perfect to enjoy by Water, Land and Air! Check this video out! Here are all Langkawi attractions you must visit, and activities you must do! We had a blast there. One week of fun, adventure and stunning nature. 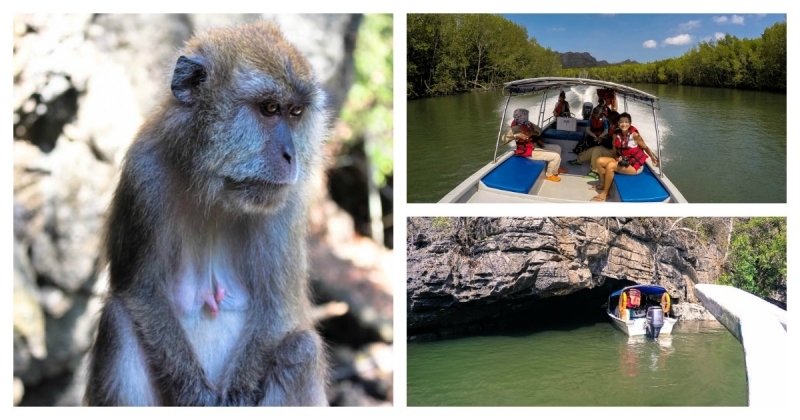 » Top Things to do in Langkawi on Water! This is one of the best attractions in Langkawi. OMG!! We had so much fun!! First we had some safety instruction and also practiced riding the jet ski on the shallow water. From Pantai Cenang beach we left for four hours tour around Langkawi. So many beautiful islets, clear sea and amazing rock formations. We got really close to some bizarre rocks, breathtaking! We stopped by many islands and beaches, but two of them were impressive. Ask your guide to go to Pulau Dayang Bunting, this island is a protected area part of the Langkawi Geopark and it´s unbelievably amazing! In the middle of the sea, a huge lake of fresh water is hidden behind the mountains. Walk to the edge of the lake where few meters of millenarian rocks divide the seawater from the fresh water. After a long walk, a dive in the lake is a must! For an amazing island hopping jet ski tour go to Mega Water Sports! 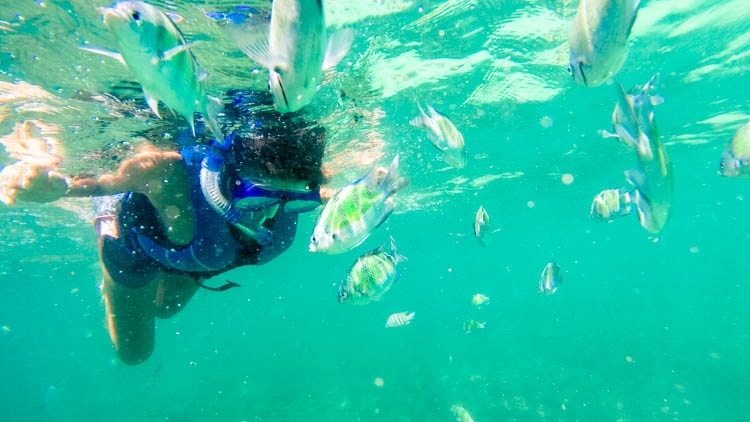 It´s not new that we love snorkeling and swimming, so our list of top things to do in Langkawi for sure includes a day enjoying the sea life. The best spot for snorkeling and dive is the Pulau Payar island that is also a Marine Park. What I like the most about this trip is that all the action happens in a floating platform, and if you are afraid of jumping in the deep-sea they have small platforms where you can sit on the water, watch the fishes and feel super safe. The sea is beautiful with so many fishes and corals to observe. There we saw a giant barracuda, two massive groupers and also swam with baby sharks! How cool!! The beach on the island is a natural reserve where the Blacktip Reef sharks leave their babies to grow. From the salt water we go to fresh water. You must visit the Kilim Karst Geopark. I have to say that before we went there I was thinking it would be a boring morning just looking at some mangroves and eagles. However, when we started the tour I changed my mind completely. 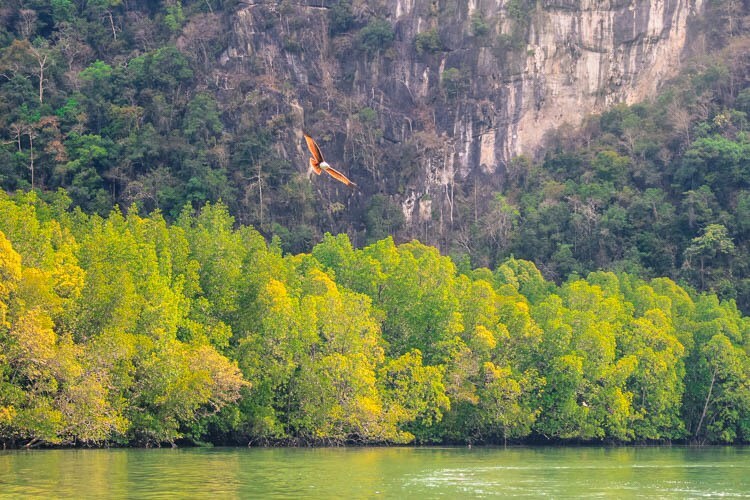 The Geoforest Park is stunning, you get together two amazing natural attractions of Langkawi: the river and the forest! By boat we passed by the mangrove forest, then crossed a bat cave (I was freaking out, because I’m so afraid of bats), we saw amazing stalactites and rock formations that date back to 220 million years. Learned about medicinal trees, observed different types of monkeys and got amazed by the beautiful flight of the Langkawi Eagle! You can find all the information about the Geoforest park in on the official website. 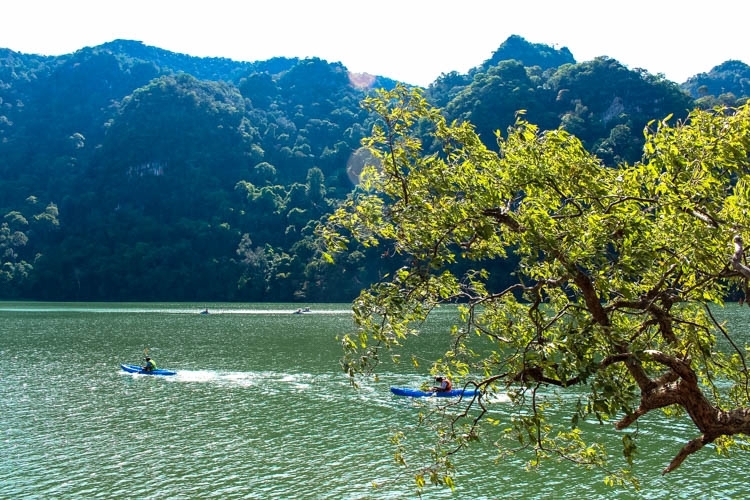 » Top Things to do in Langkawi on Land! This is the perfect place to go after lunch. It´s a paradise of trees and you can pick your own fruit for a delicious and fresh dessert. There you will learn about the fruits and veggies they grow in the island, the technologies they use to produce better without using chemicals. It´s not a boring tour at all, apart from tasting some delicious tropical fruits we also had some “fruit fun” with Mardi ´s guides. A giant star fruit and the jackfruit man were some of the jokes on the tasty & funny menu! 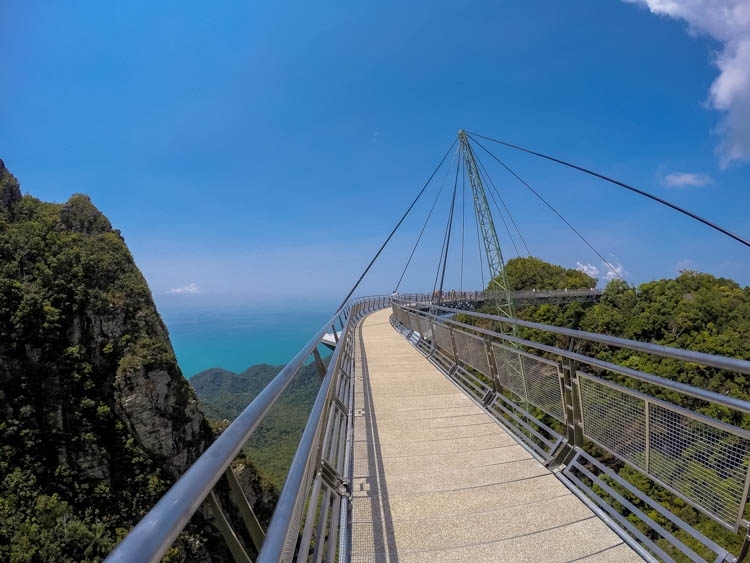 Now hold on your breath and don’t look down, we choose two unmissable things to do in Langkawi in the Air. Even if you are afraid of heights (as Rob is, although he doesn’t like to tell people about it) you must try them! Promise me!! This is the best view-point in the entire island. 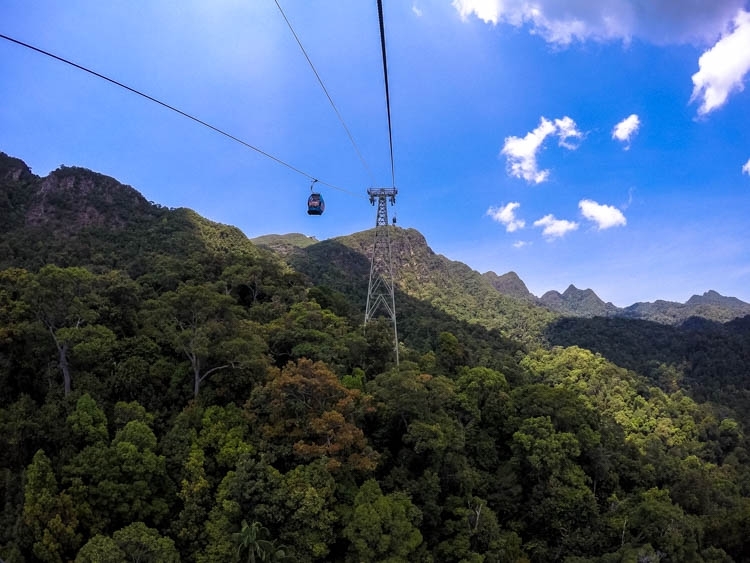 The cable car in Langkawi has two stops with a privileged view, and the trip to the top is really smooth. You go up to 950 meters above the sea level and you feel like floating in the air! When you are on the top of the mountain walk to the Skybridge and be delighted by the view from the both sides of the island! The only problem with the sky bridge (apart from the fear of heights) is that the site is still on construction and the way to the bridge is a long, long and steep walk. I consider myself fit and even though it was a tough way for me. Some people just gave up of going to the bridge in the middle of the way. I’m sure more few months this will be sorted out. Our parasailing adventure took off from Tanjung Rhu beach. We flew with Naam Adventure and it was a superb experience. 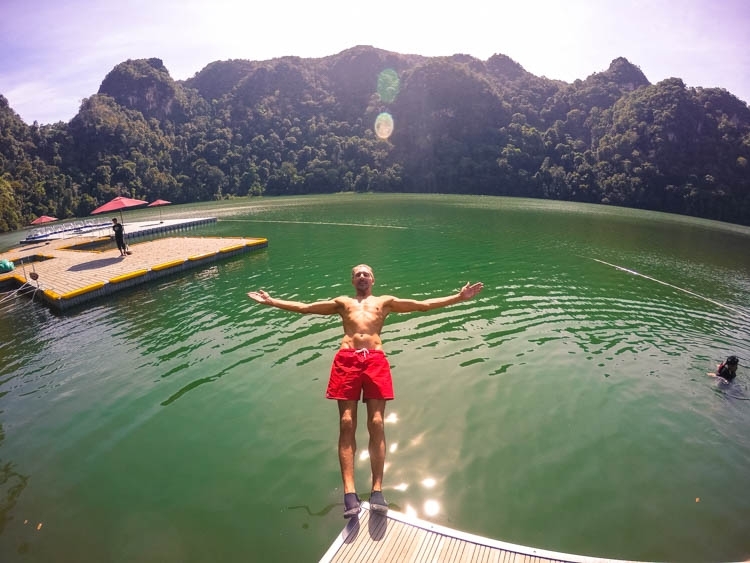 Now that we already explore Langkawi by water, land and air it´s time to feel up our stomach. 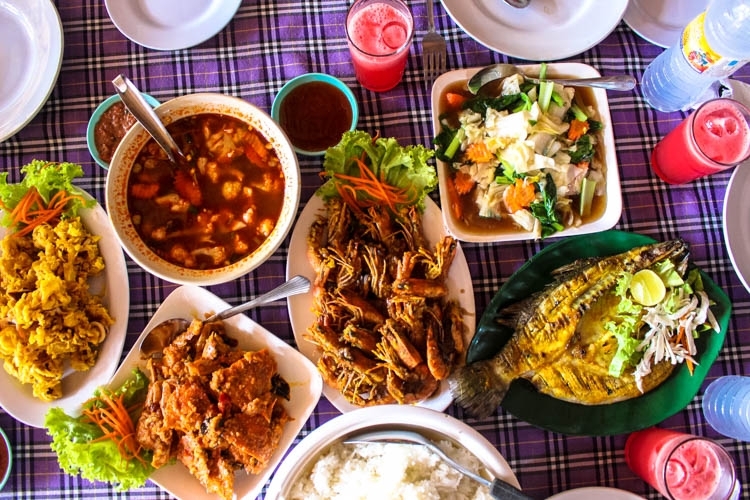 Food is definitely one of the top things to do in Langkawi. On our last post [Langkawi the Perfect Romantic Getaway] I suggested some nice restaurants to go. Here we are gonna talk about local food, some unique dishes that you must eat while visiting Langkawi. Our food tour will start with the traditional Malaysian noodle soup: Laksa! The best way to try it is to stop on one of the food stalls beautifully set in front of the sea at Kuala Muda Road (just beside the airport). Go for dinner and enjoy the sunset + good food! For lunchtime, I recommend you to eat at the Kilim Karst Geopark. Start your tour around 9 am, and you will be free to enjoy lunch at one of the floating restaurants on the river. You can see the fish farm and taste fresh delicious seafood. Yummy!! If you are looking for some foodporn action the Night Market is the place to go. Arrive early, at 6pm the grills and fry pans are already sizzling. From fried chicken to coconut pancakes, sweet juices and fresh veggies, for sure you will find something to fill up your stomach with flavours and happiness. Hotels in Langkawi! Best Places to Rest & Relax! I was so excited to talk about these attractions and the top things to do in Langkawi that I almost forgot to write about accommodation. After so many activities you will need a comfy place to rest and also enjoy the beautiful beaches. On our previous post, we recommended three incredible hotels in Langkawi (Berjaya Resort – Four Seasons – Gemalai Village). And of course they are not only for romantic getaways, single travelers and families are more than welcome there. For more options of hotels, resorts and budget accommodation in Langkawi, I suggest you to have a look at Booking.com and Agoda. All our hotels in Langkawi were book through these websites and we had an amazing experience! Love this post?! So Pin it for later!! Now you are sorted! You already know how to get there, the top things to do in Langkawi and the best options of hotels in the island. What is missing? Your comment on this post telling us when you are travelling to Langkawi! Because doesn´t matter if you are a couple, a single or a huge family, this beautiful island is waiting for you! PS: A big thanks to Naturally Langkawi and LADA for helped this dream trip happen. And for sure you got our truly opinion, despite who paid the bill! Thanks for the lovely words… Missing you guys so much!! Wow, that place looks like the perfect vacation spot, especially for snorkeling or diving, which I love! Beautiful place! There’s so much to see, do, and eat. We’re headed in that direction in a few months, so thanks for the ideas! If you are travelling to Southeast Asia, make your way to Langkawi. It’s a beautiful island I´m sure you´ll enjoy it a lot! Looking forward to it! Maybe we’ll see you around! Enjoy your time there! Now we are freezing in Europe, but I think we’ll be back to Langkawi soon! The views from Parasailing look amazing. I wish I had been brave enough to try! I loved Langkawi. I was there at Christmas and it monsooned the whole time haha! 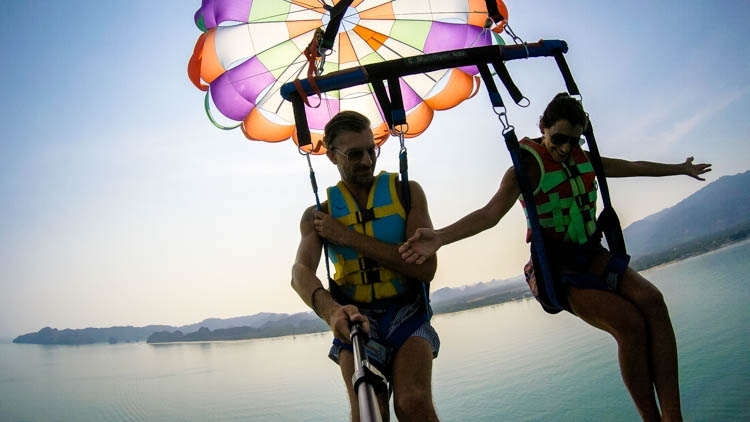 Now you have a good excuse to go back to Langkawi Sally… You must do the parasailing, is an amazing experience! Those Parasailing pics are amazing! Definitely something I’d love to try at some point! You should try Chris, Parasailing is an amazing experience. From your pictures, it seems like the beaches there are not crowded. Is this true? I love water sports, but they are less fun when you have to worry about a much of people in your way. The beaches weren´t crowded, plenty of space to enjoy the sand and the sea. The only place I heard that gets really busy in high season is the Pulau Payar (marine park where you can dive and do snorkle). If you like water sports go to Langkawi! Ooh I like these romantic suggestions! My husband and I always travel together so it’s nice to have some ideas for keeping the romance alive 😉 Thanks for sharing! So you two will love Langkawi!! Totally agree that Langkawi is great for any type of visitor! I don’t know where this idea of it being for couples comes from (although it is a great romantic getaway too), but I went there as a solo traveller and had an absolute blast! Looks great – just added it to my travel list! And I have to say that your parasailing shots are the first time that I’ve ever thought that a selfie stick would be a good purchase! Amazing photos! We bought our GoPro stick months ago and definitely during our trip to Langkawi we felt it was a worthy purchase 🙂 The pictures from parasailing and jet skiing were taken with the stick. I’m glad you liked the photos! Well, all looks quite amazing to me – and what makes something romantic? surely that’s more down to the company you are keeping? Happy that you like Langkawi Fiona! A lover of all things adventure (along with the fact that I’m currently single) all of these have me staring at the computer wishing I was in Langkawi dipping me toes in the water, parasailing or jet skiing (how cool is that?). I also think its fascinating that they have a craft centre. Never heard of such a facility, which is great! So good that you liked the post! Langkawi is a small island but has tons of things to do, apart from the nature (in my opinion their best asset), the people are really proud of their culture and roots, the craft center is the place where you can see and experiment it! That last photo is amazing! Look at all the food! I love all the colours and vibrancy in this post. I’d love to explore this area! Sign me up for a trip LangKawki! 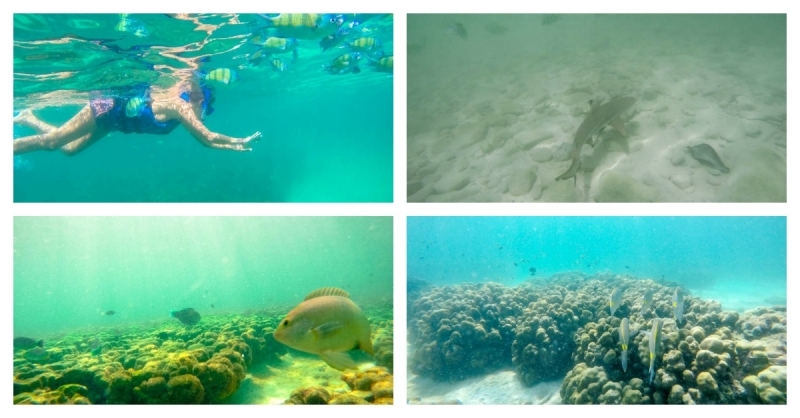 Looks like such a great variety of things to do and see, especially water related things like jet skis and snorkeling. We have never been that far east, but I think that needs to change. Some great pictures too! Make your way to Langkawi Donald, I’m sure you won’t regret! 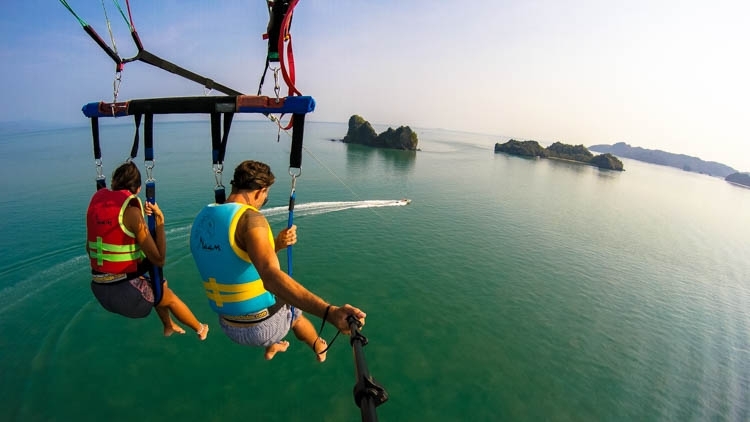 If you like water sports and adrenaline, Langkawi is the right place! Great list! Sounds perfect for singles and couples alike honestly! All of those activities sound like a brililant vacation for both myself and my husband, though I would do them all solo as well if I had to. You are so right Meg! I also love how there’s a small platform for those who are afraid to jump into the deep sea – like me! Although I’d be willing to try to jump in the deep sea (: thank you for the post! So happy that you like the post Stacey! In one word: jealous! This looks like such an amazing trip! Everything you did looks so incredible. I’m with Rob, I’m scared of heights, but I think I would still have to give those tours a try. Thanks so much for sharing. This place is officially on my bucket list. So glad that you liked Langkawi Annie!! The parasailing is amazing, for sure it is worth to do even if you are scared of heights! It looks like paradise, but it´s all true!!! Put Langkawi On your bucket list, I´m sure you won’t regret to visit it! Me nd my wife are visiting langkawi on 29th Apr. I am very much inspired seeing your updates and glad I found ur inputs. I need a suggestions. What time is it appropriate for island hopping? Morning or noon? My wife doesn’t know swimming so is it safe enough to snorkel for non swimmer’s?? How long do u need for parasailing, island hopping and snorkelling? Coz we jus have one nd half day to do all these things. So happy you liked the post and it has been helpful to you! 1º Island Hopping – I would recommend to do island hopping in the morning. Start around 9am and it will finish at 1pm. 2º The snorkel is super safe, even for non swimmers. 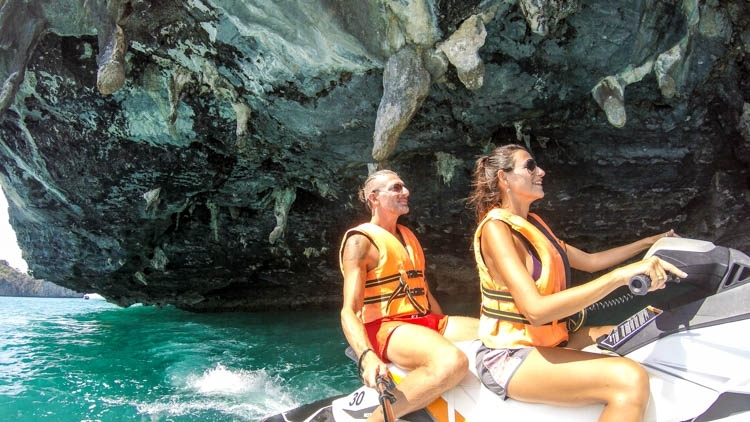 The guide will provide life jackets and there are underwater platforms where your wife can seat in the water to enjoy the sea life without going deep in the sea. 3º Parasailing and Island Hoping can be done in the same day. In the morning do the island hopping and for the sunset the parasailing. The trip to the Marina Park for snorkel takes more time. We left early in the morning and came back to the city around 4pm. So not sure if you can do all the activities in one and half day. Maybe it is better to talk with the companies to check their schedule and if they can manage to organize everything for you! Hope I could help you! If you need anything else just let me know. All the best and have an amazing trip! So happy to know that you enjoyed Langkawi too! Was a pleasure to meet you there! Where are you now? This sounds like an incredible experience! The parasailing looks like so much fun! I love how you found so much to do including culture and crafts as well as eating from a food vendor who doesn’t use chemicals. Langkawi has many things to offer Brooke! When we started the trip I had no idea how fun it would be. As you said, it´s full of adventure, cultures, craft and great food! Here thinking about visiting Langkawi in NYE. 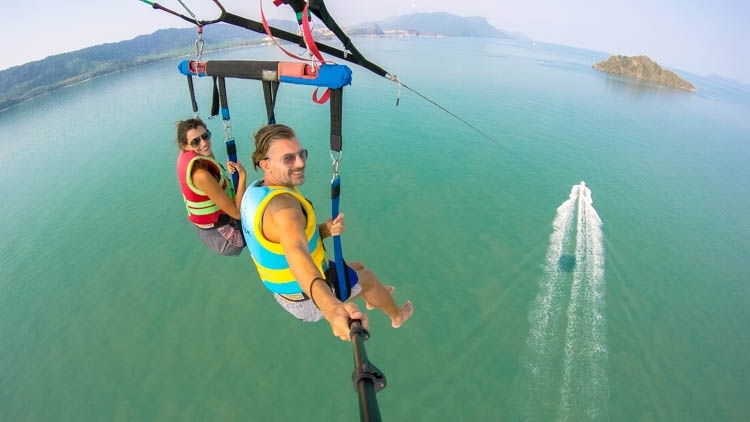 Langkawi is beautiful and you must do the parasailing… I’m sure you gonna love it! On our first trip to Langkawi, we stayed 6 days. I believe 5 to 7 days are enough to visit the island and relax. Just be aware that NYE probably will be very quite there, not much party and celebration. Langkawi is a really fun and beautiful destination!! I’m glad you liked the post! Could you guys please share your itinerary, as we’re also planning to go there for 6 nights in mid December? During our stay, we did all the activities mentioned in the post. To be honest, I don’t remember the proper itinerary or the sequence of activities. I would recommend booking one of two tours in advance, so when you arrive in the island you already have activities sorted out for the first day. The rest you can book there in the island. Enjoy your trip, Langkawi is beautiful! Thank you for your Langkawi trip posts! My parents are going to Langkawi this weekend, are you able to provide your trip itinerary as a reference for my parents? We did all the activities suggested in the blog post, the sequence and the time to do them can vary according to the weather and the if the tours are not fully booked. I recommend your parents arrive in Langkawi and during the first hours organize and book the activities. The best is to talk with the tour companies to check availability and weather forecast. This way they can organize the best itinerary to enjoy this stunning island. Hi Natalie, your post is amazing! The diving photo looks really great! While your stay in Langkawi, have you been to Makam Mahsuri? Just want to know if it is good to be visited, I found some other posts include that place, but I’d like to hear from real people who have been there before. Thanks. Unfortunately we haven’t been to Makam Mahsuri. I would suggest checking the reviews at Tripadvisor. I loved your photos of Parasailing. 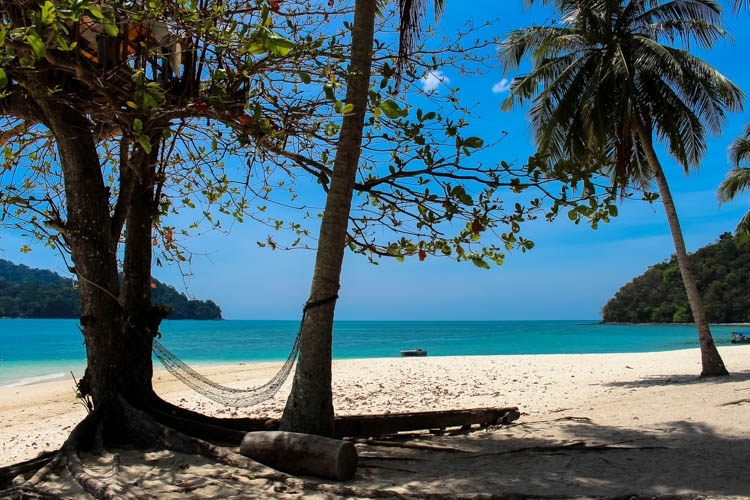 Will you please suggest the beautiful and convenient Island to visit of Langkawi? We did the Parasailing tour with Naam Adventure. Continuing with the previous comment I want to let you know we are going there on 24th instant and decided to go to Pulau Dayang Bunting Island and Beras Basah.Is it possible to visit in one day these 2? Please help. Suggest to contact Naam Adventure or Mega Water Sports, for sure they can help you on the tours.